(C.L. Koch, 1842) (Bothriuridae). The study describes the consumption, subduing time, feeding strategy and stinger use against different types of prey from the scorpions habitat (the prey differed in size, morphology and/or defense capabilities). is able to use different predatory strategies which might allow it to include prey with diverse defensive strategies in its diet. I refer to the abstract and the articles for further details on the results and discussion. Scorpions are dominant predators in some environments. Nevertheless, most studies of predatory behavior in scorpions have focused on diet composition whereas some other relevant aspects, such as predatory strategy, have been poorly explored. 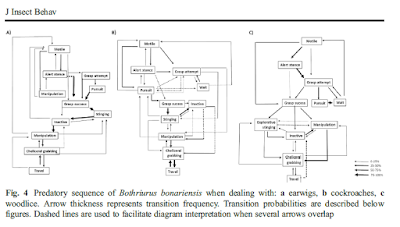 Herein we evaluate the prey acceptance and predatory strategy of the scorpion Bothriurus bonariensis against sympatric prey with different defenses. As prey, we selected earwigs (Forficula cf. auricularia) which use pincer-like defensive appendages, hard-bodied isopods (Armadillium vulgare) known for their conglobation defensive strategy, soft bodied isopods (Porcellio cf. scaber), which secrete noxious substances as defense mechanisms, cockroaches with limited defensive mechanisms (Blatta cf. orientalis.) and spiders (Lycosa cf. poliostoma) which possess venomous fangs. Prey were offered to 21 adults of B. bonariensis in random order until all prey had been offered to all scorpions. Prey consumption and the number of attempts needed for capture were recorded. We also evaluated the effect of sting use on immobilization time as well as the prey capture strategies on the most consumed prey. We found that despite using a similar number of attempts for capturing all prey, spiders and armadillid isopods were less consumed than other prey. Immobilization times were longer for earwigs than for armadillid isopods and cockroaches. Scorpions used alternative predatory strategies against these aforementioned prey, although the stinger was used against all of them. These results show that scorpions are able to use different predatory strategies which might allow them to include prey with diverse defensive strategies in their diet. (Scorpiones: Bothriuridae): Overcoming Prey with Different Defensive Mechanisms.